Beautifully appointed, sunny and light open plan living with French doors opening on to a deck at the entrance, enjoy your coffee whilst sitting here in the morning complimented by birdsong. The good size lounge leads on to the front deck with expansive views over the beach and Mercury Bay. Great for Cocktail hour! A short drive, walk or bike ride into town, Whitianga Township has everything you need from 2 supermarkets, strip shopping, great cafes and restaurants. In summer they have a Art and Craft Market on Saturday. Jump into your car, go exploring 20 mins to Kuaotunu where you'll find Luke's Kitchen stop for pizza's - they are to die for. If you drive on up and over the hill you will find beautiful white sandy Otama, Opito beaches and if its at the right time of the year you will see our gorgeous Pohutukawa's, New Zealands evergreen tree which flowers between December and January it is postcard worthy. Ferry ride and walk to Lonely bay pack yourself a picnic.have a day exploring cathedral cove and hot water beach. 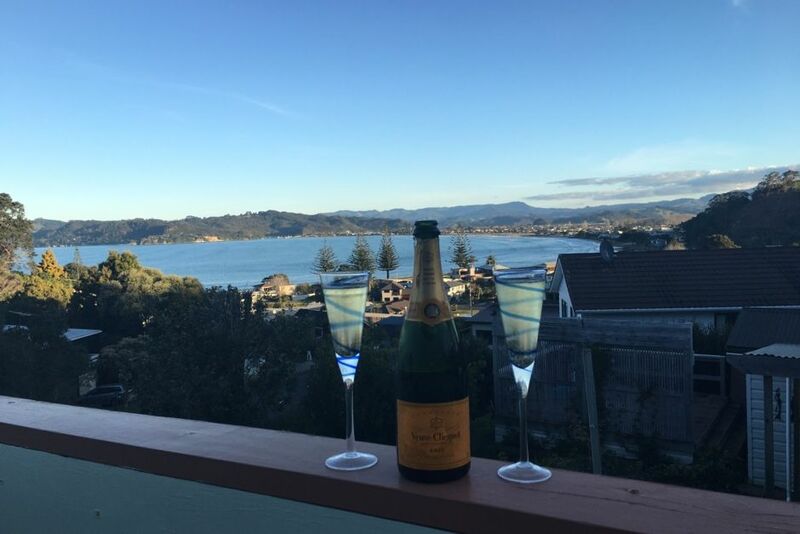 Whitianga as so much to offer and do, you'll need more than one visit. Couples andamp; Families preferred Must understand this property is not fenced off, supervision with children at all times. Walk along the beach front into town andamp; enjoy the cafes or perhaps an icecream. Great place to relax and unwind stunning view comfortable home. Awesome location, good neighbourhood, walking distance to Brophy's Beach and bike to town, great view of harbour. Driveway is tight and steep although quite short , so skill is needed ! No parking for boat or trailer available unless on the side of the road which is not ideal, otherwise no problems. The Bach was very nice, clean & tidy had everything you needed for a few nights stay. The Bach was very nice, clean & tidy had everything you needed for a few nights stay. Awesome view of the beach from the deck.